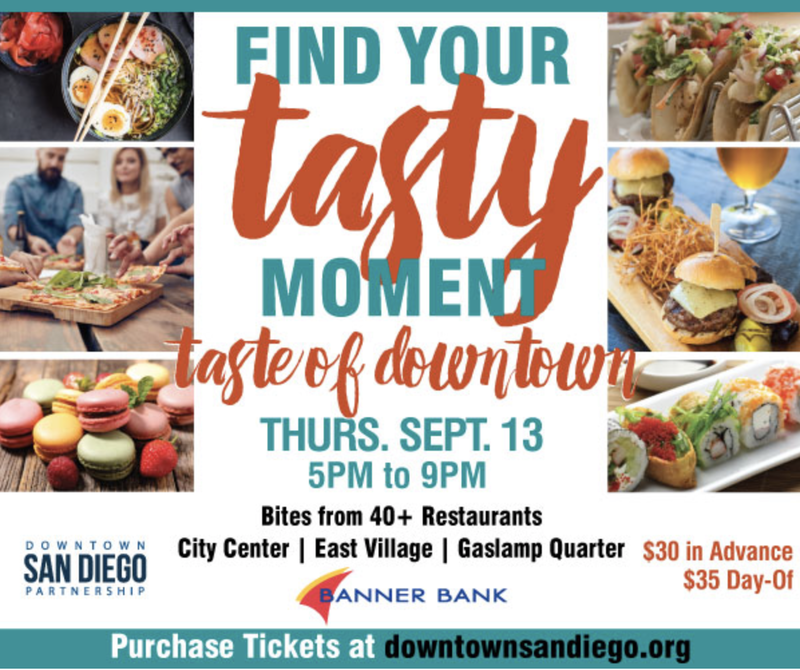 Grab your family, friends, and appetite for the 26th Annual Taste of Downtown, a self-guided tasting tour of more than 40 downtown San Diego restaurants that will take place on Thursday, September 13 from 5-9pm. We are raffling off 2 tickets and also offering our readers promo code SDVILLE for $6 savings per ticket. Enjoy tasty sample size dishes from more than 40 different downtown San Diego restaurants at this year's Taste of Downtown. This fun annual event allows attendees to explore all that downtown has to offer, without the commitment of a full menu. Find your tasty moment as you venture from one venue to the next throughout East Village, City Center, and the Gaslamp Quarter. The Taste of Downtown has established itself as one of the finest culinary events in San Diego. Be sure to get your tickets in advance, because this popular self-guided eat-a-thon will sell out quickly. Tickets are just $35 in advance and $40 the day of the event, and promo code SDVILLE saves $6 per ticket purchased online. All proceeds will benefit the Downtown Partnership, a nonprofit organization committed to promoting Downtown San Diego as the vibrant heart of our region. With a ticket, you will be treated to loads of delectable dishes and offered a complimentary shuttle service to ensure you can taste different goodies in all of Downtown’s dynamic neighborhoods. For more information on this year's Taste Of Downtown San Diego and to purchase tickets, visit downtownsandiego.org/events/taste-of-downtown.